Part of the global ACT UP network – ACT UP London is a diverse, non-partisan group of individuals united in their outsiderness and committed to direct action to end the HIV pandemic, along with the broader inequalities and injustices that perpetuate it. 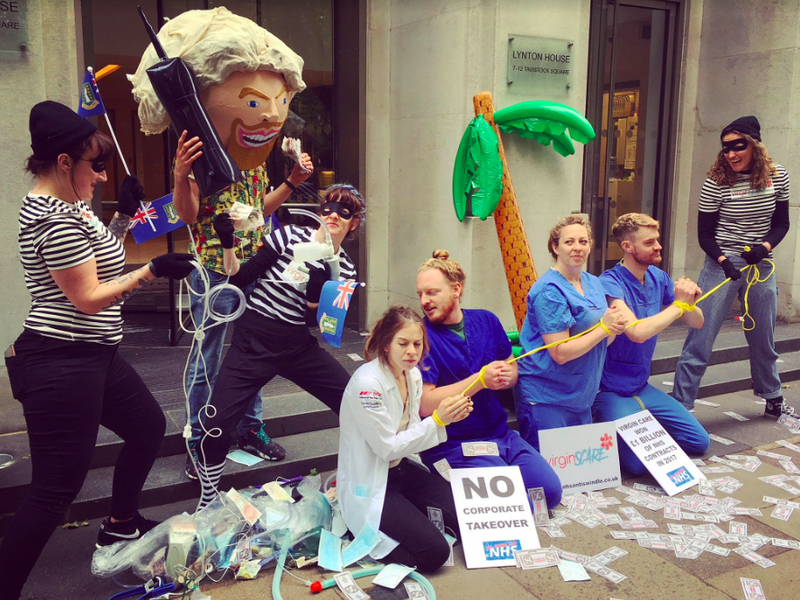 The NHS Anti-swindle team are creative activists and mischief makers and a special ActUP taskforce on a mission to save the NHS from the ongoing destruction at the hands of corporate privatisation. The UK’s National Health Service is in crisis. From PFI contracts, staff shortages, fragmented services, increased waiting lists, limited resources and serious issues around quality of care. Jeremy Hunt and his team have overseen the biggest sell off of the NHS in history, with billions of pounds of taxpayers money flowing into the offshore accounts of private companies. On July 5th, 2018 the NHS will be 70 years old. Act Up plan to celebrate its anniversary, by creating a series of creative ‘Actions’ that will expose what the Government is doing, and push back against privatisation. They create spectacular, funny and imaginative series of direct actions. 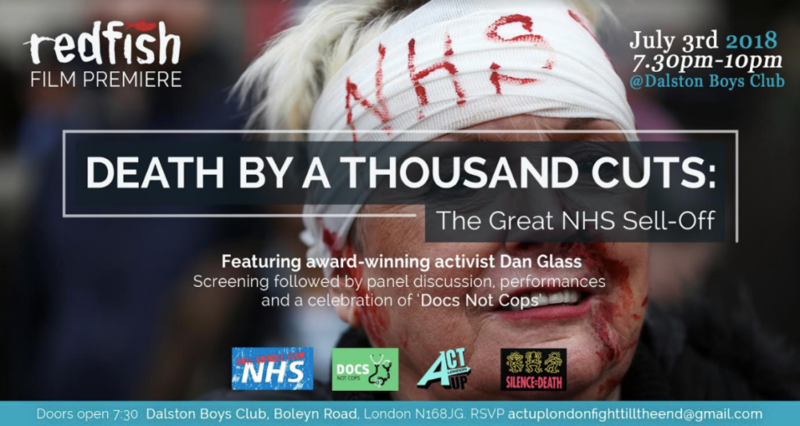 Firstly, they are working with local activists and artists in leading raucous and irreverent guided tours of London highlighting the crimes of all those involved in corruption scandals within pharmaceutical industry – from lawyers and politicians to big pharma profiteers and all of those who are benefitting off the privatisation of the NHS. 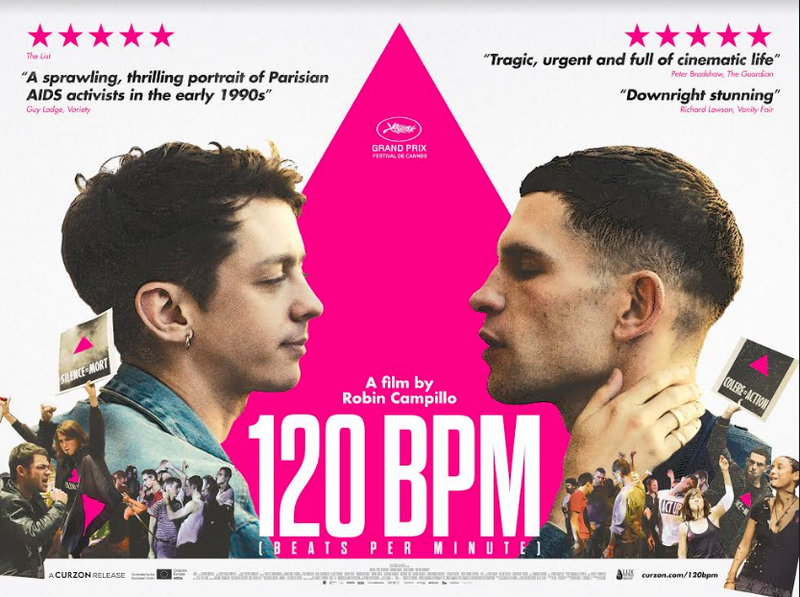 The ACT UP Paris film ‘120BPM’ has generated a surge of interest and they have been harnessing it to their advantages, and discussing these acutely political topics in film screening settings that pull in big crowds. Why is this so important right now? Today the UK is the 7th richest country in the world but the most unequal in Europe in terms of economic disparity. It’s often said that the state of healthcare is a key indicator of a nation’s development: however Theresa May and her cabinet are trying to privatise the NHS, with HIV/AIDS care greatly at risk. At the moment there are clear problems facing people living with HIV and Hep C which this action will address: Lack of access to PREP Restricted access to Sofosbuvir and other direct acting antiviral HCV treatments Threats to HIV services through the NHS with no interrogation of impact of the high prices being paid for HIV medication The UK debate on access to treatment and health has largely focused on the political and technical decisions of health ministers and NHS bureaucrats. This has meant that people are insulated from the reality of the failings of the pharmaceutical R&D system and the impact on the sustainability of the health service. 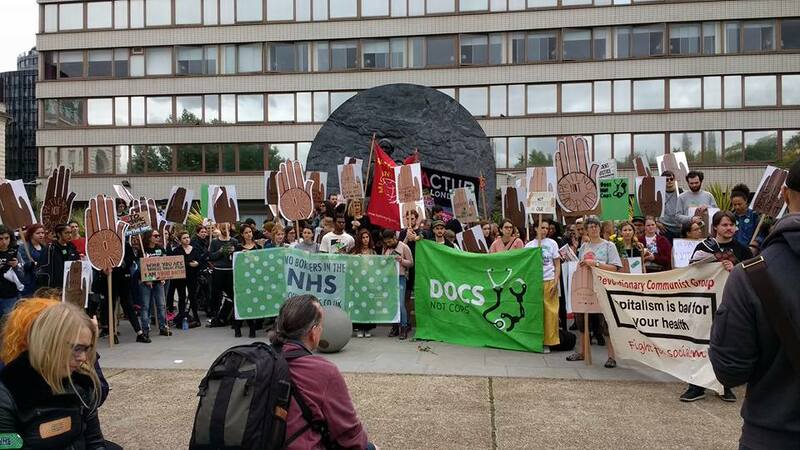 ActUp want to use this funding to bring greater focus on the role of the pharmaceutical industry on the levels of access in the UK, and to agitate for a more just system for medicines at a time when the NHS is under unprecedented threat. (5) Confronting the price of HIV / AIDS drugs, which includes a demand to re-prioritise PrEP and Sofosbuvir. No other groups are critically challenging the prices of HIV and HCV medicines and no other groups are mobilising patients and people at risk to secure access to PREP. Moreover, no other group is looking at the systemic problems which undermine HIV care and threaten the future of the national health service. 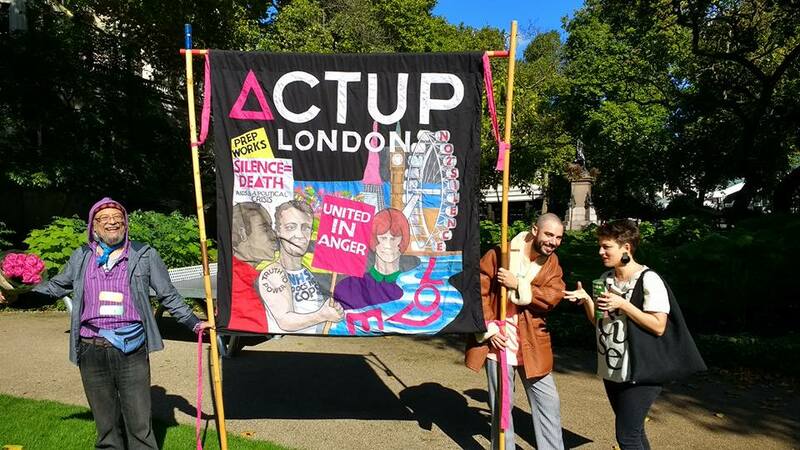 ActUp London comprises a critical contribution in an otherwise neglected area of medical advocacy. In order to assure the sustainability of their achievements, ActUp is focused on changing legislation, and improving medical research, treatment and policies to ultimately bring an end to the disease and other aspects of health injustice. 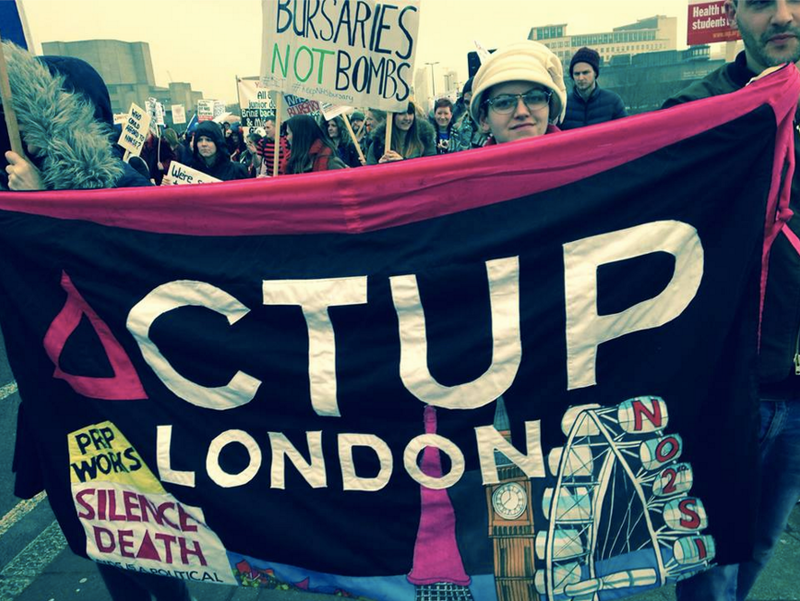 The ActUp London team aim to sustain their impact by doing direct action on medical injustice. Inspired by the activism and outrage of people both in the medical profession and recipients of public health services, their main target over the coming year comprises the prevention of further privatisation of the NHS, prevention of the decimation of health services for the vulnerable and marginalised, and ensuring universal access to HIV and Hep C drugs and the Guerrilla grant will horizontally support these main areas of activism work.